How to identify and effectively control cutworms using proven, organic and least-toxic methods. Many species of cutworms from the night-flying moth family Noctuidae are found in home gardens across the United States. The larvae commonly feed on plant stems at or below ground, eventually cutting them down. Cutworms attack a wide variety of plants including beets, cabbage, broccoli, kale and cauliflower. Cutworm caterpillars (larvae) are stout, soft-bodied, gray or dull brown caterpillars (1-2 inch long) that curl up when at rest or disturbed. They feed at night and burrow into the soil during the day. Adults are dark gray or brown, night-flying moths (1-1/2 inch wingspan) with ragged blotches or stripes on their wings. They do not damage plants. Note: Pest populations vary greatly from year to year. When numerous, cutworms can destroy up to 75% of a crop. 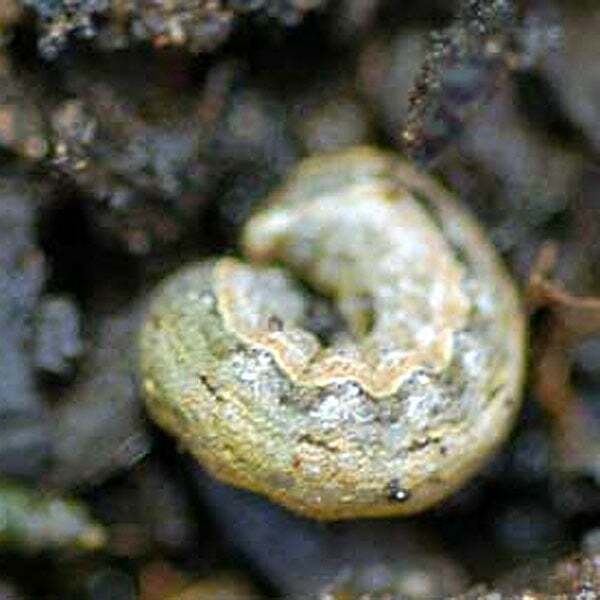 Most species pass the winter in soil or under garden waste as young larvae. In the spring, as temperatures warm, they become active and begin feeding on plants at night remaining hidden during the day. The larvae molt several times and when fully grown pupate in the soil (late spring). Within one week moths emerge and begin laying hundreds of eggs mostly on stems and leaves. One to five generations per year, depending upon the species. Note: Overwintering larvae and the first generation in the spring are the most damaging. A few species pass the winter as pupae or hibernating moths. Damage occurs at night when caterpillars feed by clipping off seedling stems and young plants near or just below the soil surface. Often, an entire row of newly planted garden vegetables will be cut off during the night. Different cutworm species will climb plants doing damage to foliage, buds and shoots. Cutworms are also known to gouge potato tubers. Late season cutworms will tunnel in fruit. Cut worms, like their close cousins armyworms, will also frequently attack turf grass. The damage they inflict on grass — cutting off blades at the crown — is usually more dispersed than damage from army worms. Cutworms favor golf courses where they cause “ballmark” pockets of dead and missing turf both on fairways and putting greens. Losing precious transplants once to cutworms is all most people require to implement preventive measures as part of an Integrated Pest Management plan. There’s little more heart-breaking than coming out to the garden one morning to find the seedlings you started months ago indoors have been severed at the root. 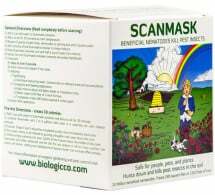 Before planting a new garden remove weeds and plant debris that might feed and shelter developing larvae. Turn the soil after fall clean up then give birds and other predators a chance to pick off the expose larvae and pupae. Mow as closely as possible to the edge of your garden to give cutworms less to feed on and less shelter near your plants. A three-foot wide (or more) bare-soil strip between your lawn and your garden plants makes it harder for larvae to reach your plants. It also gives you more of a chance to spot them. Wait as late as possible before setting out starts. Cutworms go on the move early in the growing season. Give them a chance to starve before you put out dinner. Place cardboard collars (or milk containers with the bottom cut out) around transplant stems at planting time. Be sure to work the collar into the soil at least an inch or two. Plant sunflowers along the edge of your garden. Sunflowers are a favorite target of cutworms. The plants will attract the larvae giving you a chance to pick them from the ground before they head to your corn. The presence of many birds feeding in the yard may indicate cutworms in your turf. Handpick caterpillars after dark. This is often most productive following a rain or thorough watering. Slow the progress of worms, who don’t like navigating dry soil, by watering in the morning then cultivating your garden’s walkways lightly to a depth of an inch or so. This cultivated soil will dry quickly while trapping moisture beneath it. Do not use mulch which gives the worms shelter. Beneficial nematodes released in moist, spring soil will attack and destroy cutworms living underground. They’re especially beneficial to apply the season after cutworms have been a problem. At the first sign of moths, release trichogramma wasps weekly for three consecutive weeks to parasitize cutworm eggs. 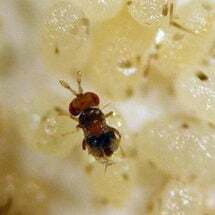 Spreading a line of diatomaceous earth around the base of plants sets up a barrier to larvae. 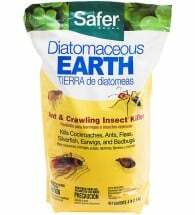 Diatomaceous earth, the fossilized, abrasive remains of prehistoric sea life, literally lets you draw a line in the dirt that’s deadly to any larvae that pass over. 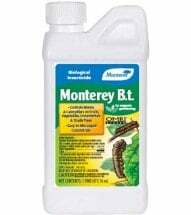 Scatter bran or corn meal mixed with Monterey Bt (Bt-kurstaki) and molasses on the soil surface to attract and kill caterpillars. 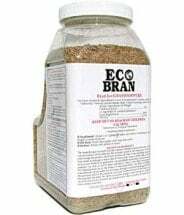 Eco-Bran will also kill caterpillars that feed on it. Note: Gardens that were covered in grass or weeds the previous season are especially attractive to this pest.